The color on the aloe hybrids is absolutely wonderful at this time of year. Just a shot across the bow of the greenhouse...a miscellaneous collection of plants. I had to take two separate pictures to show the plant off as it should be. 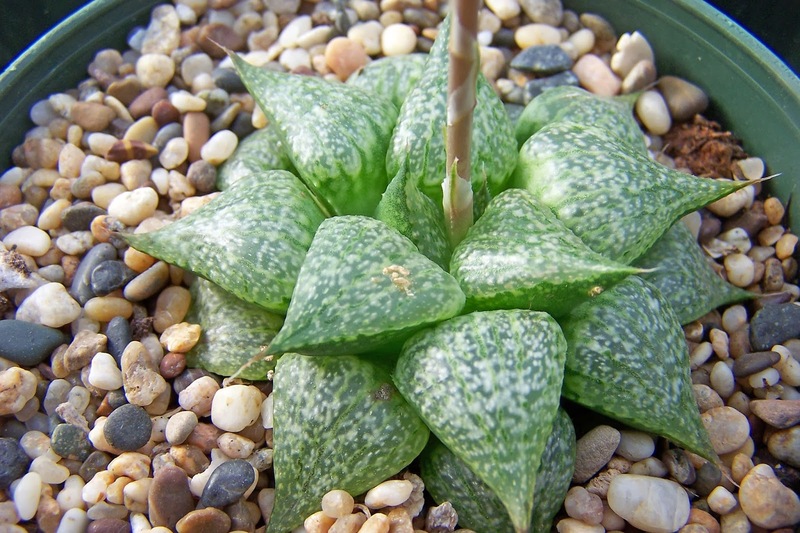 Haworthia flowers aren't generally though of as anything special, and we growers of lots of plants may sometimes get a little jaded on them. But I think they're a part of their charm. This is growing on the windowsill in our front room next to the Christmas tree...making its own contribution to the holiday spirit. Guess what? I'm finally back with some photos! I'll try to be a little more consistent than I have been lately. This Massonia jasminiflora was flowering recently and I took these photos. This plant was originally from Guy Wrinkle and has collection data. Another post with no photo! I promise, more are coming. In the meantime, passing another one of those milestones, I turned 74 today. It's hard to believe how much has gone under the bridge in that time and how much has changed. But I'm continuing to enjoy the ride and that's what counts! And, trying to make at least some positive difference one small experience at a time. So today we raised a glass to the future and the wonder and love which it will bring. My best wishes to all of you for a magnificent 2014, and many more years to come.